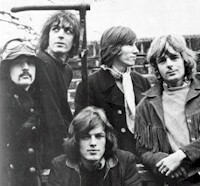 Group's Main Members: Syd Barrett, Roger Waters, David Gilmour, Nick Mason, Rick Wright. Most bands do not survive if their lead singer, chief song writer and leader leaves. But for Pink Floyd, this not only happened once, but twice and still they roll on. The origins of Pink Floyd developed at Cambridge High School in England in the early sixties. Syd Barrett, Roger Waters, and David Gilmour were all friends there and talked about forming a band. But after graduation Gilmore decided to go on to art school in London as Barrett wandered around the country side.Waters meanwhile attended a architecture school in London where he met Nick Mason and Rick Wright. They formed a R&B band called Sigma 6. With Waters on guitar, Mason on the drums and Wright on keyboards, the band also consisted of bassist Clive Metcalfe and vocalist Juliette Gale (who later would marry Wright). That lineup didn't last to long as Metcalfe and Gale left and Waters switched over to bass and Bob Close came on to play lead guitar. The band's name changed several times and then Close quit. By the end of '65 Waters, Mason and Wright joined up with Barrett who would become the band's songwriter, lead guitar player and lead singer. He renamed the band Pink Floyd - in honor of blues' musicians Pinkney 'Pink' Anderson and Floyd Council. Under Barrett's guide Floyd would start out quite differently than the concept album kings they would later become know as. With their first two albums they were a psychedelic band. They recorded their first two song in early '66, one, Barrett's "Lucy Leave" a combo R&B & pop song that got the band some attention. They began to play the London underground with experimental light shows and instrumental feedback that was still unheard of at the time. In early 1967 they signed with EMI Records and released their first single "Arnold Layne" which didn't sound a lot like their live show but never less was a hit reaching the UK's Top 20. Their next single "See Emily Play" was a even bigger hit and reach number 6 in June of '67. Later in '67 their debut album The Piper At The Gates Of Dawn was released. The album did not contain their first two hit singles yet it became a Top Ten hit anyway. Many claimed it to be the greatest British psychedelic album other than the Beatles Sgt. Pepper's. It contained mostly Barrett penned songs that were far out experimental pop fantasies with lengthy riff-laden instrumental passages.With the album's success they began to tour, first with Jimi Hendrix. But it was during the US tour where problems with Barrett started to show up. Syd was a true gifted genius but also a step away from insanity. He was now a heavy LSD user and it started to take its toll on him. On the US tour he would start to play music out of the blue that wasn't a part of the band's set and at other gigs he would stand on stage and not play at all. In interviews he would be incoherent. In late '67 Floyd released a third single "Apples And Oranges" but two other recordings made at the time, "Vegetable Man" and "Scream Thy Last Scream", were unsuitable for release and Barrett was at this stage to wasted to finish them properly. His fellow band members knowing they were about to see the band crash if they didn't do something, hired Waters' and Barrett's old high school friend Gilmour as a fifth member in February of 1968. Gilmour was to take over the lead guitar. Plans would be for Barrett to stay in the band but not play live any longer. However the five piece Floyd didn't last long as Barrett's mental instability grew worse and he left the band just two months later. He did go on to record two somewhat successful solo albums shortly after his departure from the band but then disappeared into oblivion, his mental problems totally taking over his life. The new Pink Floyd would become even more of a hit. The next album Saucerful Of Secrets was still somewhat like the debut with one leftover Barrett song, "Jugband Blues", but things would be changing. Waters took over most of the writing and lead vocals and Gilmour was an excellent guitarist. The band drew 100,000 fans for a free concert they did in London in '69 and the next few albums showed a change in style with '71's Meddle getting the best of the reviews. Then in 1973 they released their masterpiece, Dark Side Of The Moon. The album would turn out to be one of music's best selling albums, staying on the Billboard chats for more than a decade, selling over 25 million copies. Waters' writing was brilliant and the stereophonic sound effects had to make this album one of the best ever to listen to while wearing headphones and smoking herb. Although Floyd had been a big hit in England for years before Dark Side Of The Moon, it was this album that now made them superstars in the US and the rest of the rock world. So how would the band follow up on their next album? Yes, it would take another monster effort and Waters and Company were up to it. Although it didn't sell as many copies as Moon did, 1975's Wish You Were Here was musically as great. Personally, this writer likes it even a bit more! The album's songs blended together better than any other concept album. Wish You Were Here was dedicated to Floyd's lost founder, Syd Barrett, especially the song "Shine On You Crazy Diamond" which was written entirely about him. Surprisingly during the album's recording at Abbey Road studio, Barrett showed up to pay a visit. It was the first time anyone in the band had seen him since '69 and it also would be the last time (at least to date). Their next album, Animals (1977) was another hit but not as well received and problems were now starting to show in the band as members weren't getting along and talk of a break-up was in the air. But in 1979 they released a double album, The Wall, it would go on to be their second biggest selling album. The tune "Another Brick In The Wall" would turn out to be their only number 1 single. But relations within the band were getting worst. Waters and Wright hadn't got along well for years and Waters insisted on the band's firing of Wright which finally took place in 1980. Gilmore meanwhile was upset with Waters for the lack of credit he was given on The Wall and Mason took Gilmore's side in the dispute. It didn't seem there would be anymore new Floyd albums as the band seemed doomed, but to everybody's surprise they released The Final Cut in 1983. Truth being, the album was more a solo project for Waters as Gilmore and Mason had little to do with it. Also with Wright gone now, little of the electronic innovation which was so typical on their previous albums showed on this one. The album was a disappointment to many. Shortly after its release the band split up. All the members did some solo albums and then in 1986 Gilmore and Mason decided to reform the band. Waters was totally against the whole deal claiming without him there could be no Pink Floyd and he went to court to stop his former band mates. He lost and in '87 Gilmore and Mason joined up once again with Wright for the new Floyd. That year they released the album A Momentary Lapse Of Reason which once again sounded like the old Pink Floyd. With a bunch of session players helping out, this album may not have been as great as past Floyd albums, but still it was a good album. The band then hit the road for a successful worldwide tour and the next year the live album Delicate Sound Of Thunder was a hit. The next studio album, 1994's The Division Bell was a full group effort and once again held the band's true sound. In '95 they released yet another double live album, Pulse which was well received by fans. Meanwhile Waters remained bitter towards his former mates and his solo career seems to be stalled. The last word on Barrett is that he's institutionalized in poor health. Addendum - On Saturday July 2, 2005 at the Live 8 concert, the classic lineup of Pink Floyd performed together on stage for the first time in over 24 years, and for what would turn out to be the last time. Addendum 2 - In July, 2006, Syd Barrett passed away at the age of 60.